The Tory rebels, and the government, believed that a last-minute panicked concession from the government side had walked Theresa May back from the brink of defeat. Frantic conversations between the government, the whips, the party managers and their MPs who were tempted to rebel had been taking place all day. We saw cabinet ministers take MPs aside - for just a quiet chat of course - in the closing moments of the vote. 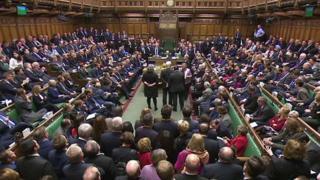 And during the voting, which always takes about 15 minutes, some of those who were tempted tweeted that they had decided to abstain - the last minute promise from the minister, Dominic Raab, had changed their minds or delayed the clash. We saw as one of the possible rebels, a new Scottish MP, Paul Masterton, was cajoled by the Defence Secretary, Gavin Williamson (the chief whip until weeks ago) - then after the conversation, picked up his mobile phone and tweeted that he was going to abstain. But the arm twisting and arguments failed. As the MPs who count the votes made their way to the Speaker's chair, the opposition teller made their way to the outside of the despatch box. It's a physical signal of telling MPs who has won before the official announcement takes place. As that happened the House of Commons erupted - well at least the Labour side. Ministers looked like they felt sick. The deputy speaker had to call for silence so the chamber could hear the actual result. Total silence, and then disbelief as the result was read out. The government had been beaten after all, by only four votes. It's possible too that it was a miscalculation that could have been avoided. Had the minister at the despatch box put forward the concession even a few hours earlier, that tiny number of votes might have gone the other way. This is only the first big piece of legislation related to our withdrawal from the EU and it has run into trouble. And one of the leading Tory rebels predicted the government will have to drop one of its other plans, to put a Brexit date in the withdrawal bill, next week. The broader risk for May is not just that she will have to budge on this particular issue, but that the small group of rebels in the Tory party is strengthened by actually having had this kind of impact - and the opposition parties are already emboldened. Theresa May had been having her first good week in many, many months. That brief respite just might have come to an end. Stephen Hammond, one of the rebels, has just been sacked from his position as deputy Conservative Party chairman. Tonight, no-one is playing nice.